In the blink of an eye, your baby went from gurgling to graduating. Hats off to a job well done and the new opportunities to come! Instead of treating your party like one last exam to ace, we’ll help you plan accordingly so you can enjoy the festivities and play the part of the proud parent (instead of harried host!). 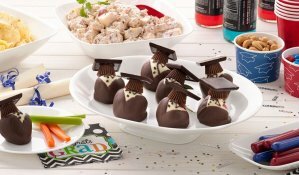 Get ready to give your grad the party he or she has earned. June weather lends itself to taking the party outside. June weather can also be unpredictable. Not that it’s going to storm—that will absolutely NOT happen on the day of your party. But in case gray skies throw you a curveball, have an idea for how you’d set up food and decorations in the house or garage. Or consider renting tents to keep your tables and chairs safe from the elements—even if it’s a beautiful sunny day, you might need the shade. Choose items according to convenience. Sandwiches are easy to make, serve and replenish. (Figure on 1 to 2 per person.) “Walking tacos” are fun and customizable. Salads can either be sides or mains, if you add protein. Round out with fresh fruit platters and veggie trays, as well as items like chips, pretzels, snack mixes, nuts and other easy-to-grab munchies. 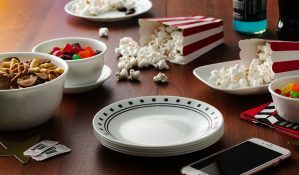 Disposable plates and platters might seem like a smart shortcut, but Corelle® dishware is lightweight and super durable, plus the white collections go with any school color combo! 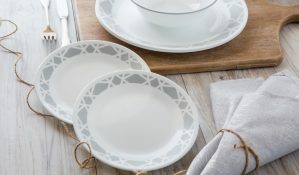 Pick up a stack of CORELLE LIVINGWARE WINTER FROST WHITE DIVIDED DINNER PLATES or CORELLE SQUARE PURE WHITE DINNER PLATES and you’ll use ’em again and again! Ask a couple of friends or family members to take on buffet duty. They’ll be responsible for refills and requests, and you can return the favor for their grad party! TIP: Pad your head count. A little too much is always better than not quite enough. On warm spring days, food safety is key. Make sure you have enough refrigeration space and coolers for the types and quantity of food you’ll be serving. You’ll also need to have plenty of clean ice to keep salads, fresh fruit and vegetables, and meat and cheese trays properly chilled. An alternate idea is to fill a shallow plastic container with ice and set serving bowls on top. 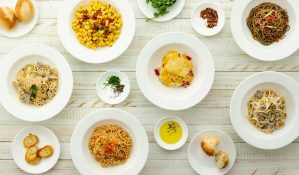 Be sure to use smaller serving bowls and replace when empty rather than adding fresh food to the dish that’s been sitting out. Perishable foods should be left out no longer than 2 hours; 1 or less on hot days. Hydrated guests are happy guests, so make sure you’ve got plenty for your guests to drink—especially on a hot day. Assume up to 3 beverages per person, and provide cool options like water, iced tea, lemonade, punch and soda. If you’re serving alcoholic drinks like beer and wine, keep pitchers or coolers of water nearby. And be sure to have coffee available, too! On the off chance your big day is cool and rainy, you’ll want to make sure everyone stays warm. Get your grad involved by asking them to help create a display that’ll share years of memories and accomplishments with your guests. Think photo boards, scrapbooks, trophies, awards, certificates and other meaningful memorabilia. After all the planning, you’ll want to enjoy the big day, rather than get stuck documenting it. Ask someone else to take on that responsibility—or better yet, ask everyone else. Smartphones have made it easy to snap anything anytime, so create a hashtag (i.e. #AnnaGradParty) and ask guests to use it when posting photos on social media. By the end of the party, you should have a well-rounded collection of photos and you won’t have taken them all—which also means you’ll actually be in some! YOUR TURN: How will you make your party fun and successful for both your grad and you, the hosts?